Crystal glass is not really crystal like quartz or gems, but comes from the Italian word “cristallo”, meaning a certain kind of imitation glass. Crystal glass today is glass containing lead, used to make the glass clearer and more sparkly than ordinary glass. In the United States crystal is defined as having at least 1 percent lead, while European crystal has 10 to 30 percent lead. Among florists a vase is a container taller than it is wide, but among non-florists it can be pretty much any container used to hold flowers. Crystal vases can be used as decorations alone or to show off particularly beautiful floral arrangements. For engagements, weddings, and anniversaries a gift of flowers in a crystal vase provide not only the flowers that the occasion deserves, but a lasting beautiful heirloom. Crystal vases are available from several makers. Some of the best known names in crystal are: Baccarat, Godinger, Lalique, Lenox, Nambe, Orrefors, Swarovski, and Tiffany. Baccarat has the distinction of making several modern crystal vases, such as its Spirale designs and its Passion clown vase. The latter is composed of a simple shape ornamented with dots. The Objectif bowl is named after the French word for camera lens, due to its simple lens-like shape. Many other interesting designs await the shopper. Godinger is among the most affordable crystal, and offers a good variety of containers. Its Impressions set of five crystal vases combines simple, modern lines with a whimsical note. The vases’ necks are tilted at different angles to give the set motion when all five are lined up. The company’s Colonial crystal basket can be used to hold Easter eggs or flowers for any time of year. Godinger’s Pumpkin biscuit box is not strictly designed for flowers, but would be good for fall-colored flowers or for holding candies at Halloween. That’s just a small sample of what is offered. Lalique’ Tourbillons vase was designed in 1929 in art deco style and has become a classic today. Lalique offers several crystal vases in midnight blue, amber, red, purple, light blue, green, gold, and turquoise. The Poseidon vase with its seahorses would be great with an arrangement of flowers that look as if they should be underwater–braziliensis, dusty miller, proteus, and spider lily. The ornate Versailles vase would make a great foil for a simple monofloral arrangement of calla lilies. A whole catalog of Lalique allows the creative decorator to find something for every taste. 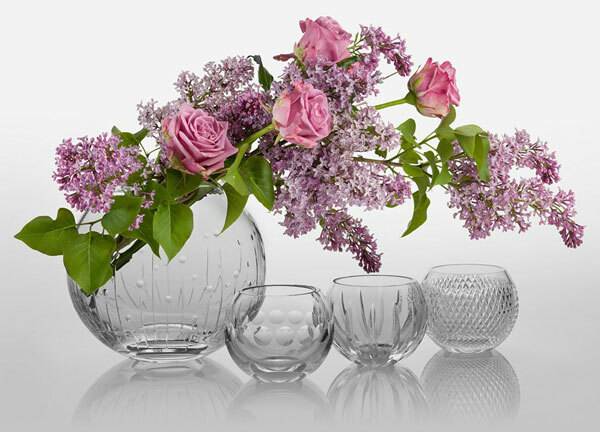 When we think of Lenox fine China often comes to mind, but the brand has a lovely collection of crystal vases as well. The Marchesa painted camellia vase was inspired by designer ball gowns. Several more simple modern bud vases are also available in shapes such as cylinder, ginger, and urn. Ruffled vases are available in clear, smoke, turquoise, purple, and amber. Nambe has some truly original crystal vases.River vase, with its twisted shape, is designed to give the impression of running water. The Planar vase combines flat surfaces with lines to vary its texture. Can-can and Lovebirds are just two more of many interesting and eye-catching crystal vase designs. Orrefors has collections of both glassware and crystal ware. Vases seem to take on a life of their own with combinations of straight and curved sides. When free-form vases, bowls, and candle holders are clustered together they can be arranged to make perfect cylinders and square. The wave vase has undulating lines to symbolize ocean waves. An excellent piece to decorate a beach house or a room with a pelagic theme. Display a conch shell nearby or fill with sea glass. The Cathedral bowl, although a simple modern design, was inspired by the arches of European cathedrals. That and much more await in fine crystal shops. Swarovski is known for perhaps the most elegant of the crystal collections. The company’s Crystalline vase has a stem filled with thousands of glittering chatons, or Austrian crystals. Fill the top with flowers or add more Swarovski crystals in a contrasting color. Swarovski’s wine glasses are also good used alone or in a group holding small, perfect roses. Swarovski also makes crystal flowers and statues of birds and other animals in colored crystal, so use your creativity in putting together an entire display. The Swarovski collection is easily accessible since the company has its own retail stores in many malls. Tiffany enjoys a well-deserved reputation for delicate, beautiful things. Tiffany’s Lily of the valley vase needs no flowers to detract from its tiny representations of white coral bells. Or choose the Mediterine trumpet vase with its lovely little depictions of sea creatures. Tiffany’s Tulip vase has depictions of delicate vines climbing up its sides. The Floral vine rose bowl has similar vine depictions around a perfect sphere. Fill with water and float roses on top, or hold roses under water for a few seconds until water permeates them and they stay underwater. The company’s Lillian jug, although designed to hold wine, would make an elegant statement with a single stem of white orchids. When buying crystal vases save the containers they come in. They are carefully designed and built to keep their contents safe. On moving day you will be glad you still have the ideal container for packing your beautiful piece. If you live in an earthquake-prone area, velcro sticky pads can be placed on the bottoms of your vases as well as to the surfaces under them to keep them from falling. Crystal vases should not be washed in dishwashers and should not be exposed to extreme hot or cold, since extreme temperatures will cause them to lose their luster. Wash crystal under a stream of running tepid water and dry with a soft clean dishtowel. Some people use a little vinegar to prevent water spots. Crystal vases should be displayed with plenty of space around them so that they will be shown to full advantage. Place your vases near sunny windows so that sunlight meeting the crystal will split into rainbows on the walls behind it. We have covered only a little of what is available and what you can do with crystal vases. Now go and see the real thing.